We awoke in the morning to find the wind had not dropped as forecast.. Should we set off and see how we got on? Surely it would drop eventually.. 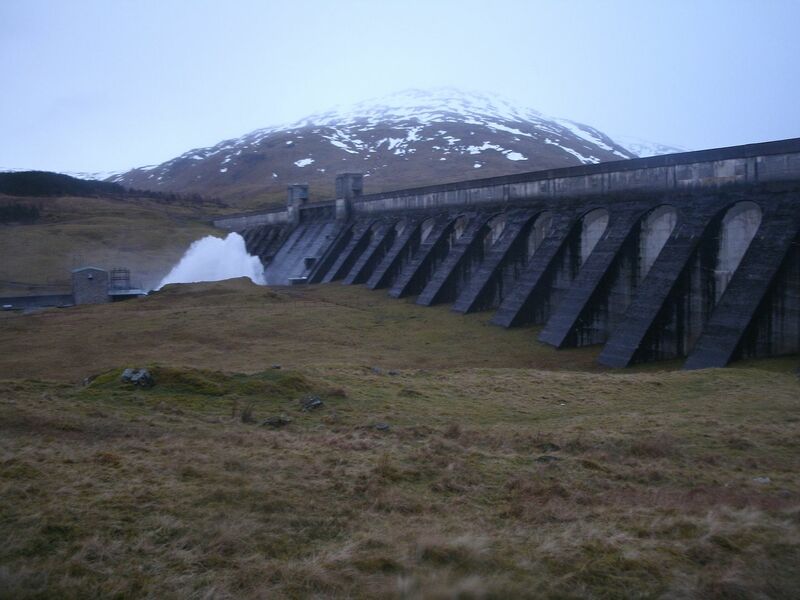 So we drove up to the dam, and with drizzle getting blasted in our faces, we headed up the road that goes over to Glen Lochay. 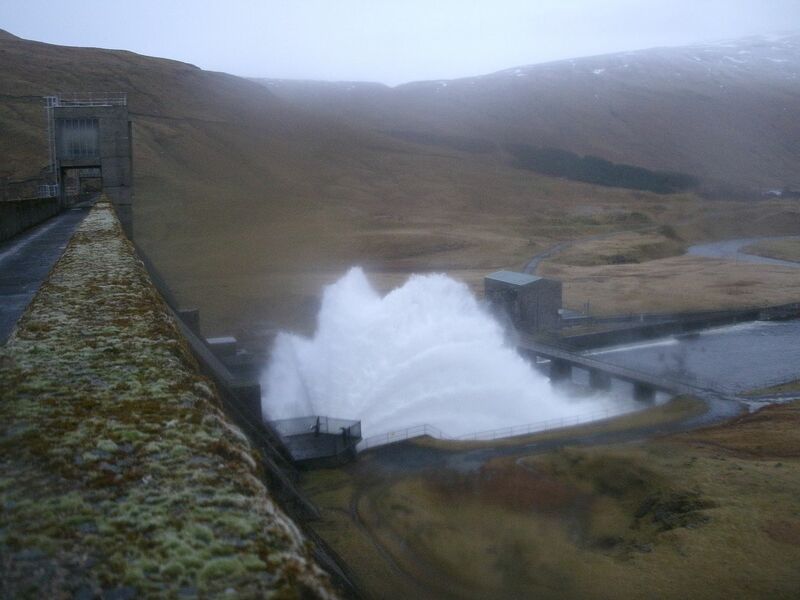 As we got a little higher, we got a good view of the dam, and saw a huge jet of water getting blasted into the air.. 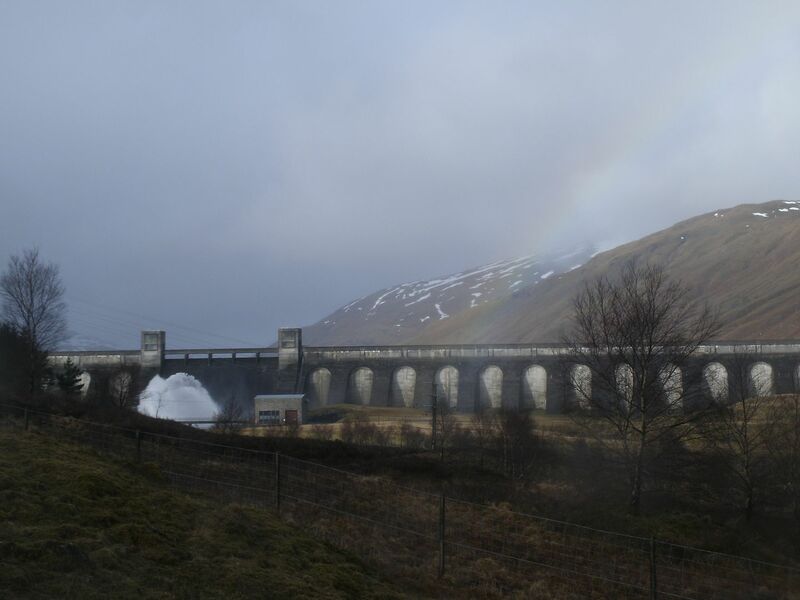 The sun came out a bit, didn't make any difference to precipitation levels, but at least there were some dim rainbows to raise a smile to our faces. We turned off the road toward the dam, which turned into a track soon after. Some of the gusts had me stopped in my tracks, which made for a surprisingly energy sapping walk along the undulating track alongside the loch. Once over, we sheltered by the side of the track for a cereal bar, then headed stright uphill. It was an easy camber at first, but it soon got steep, and increasingly snowy. No firm consolidated snow anywhere! 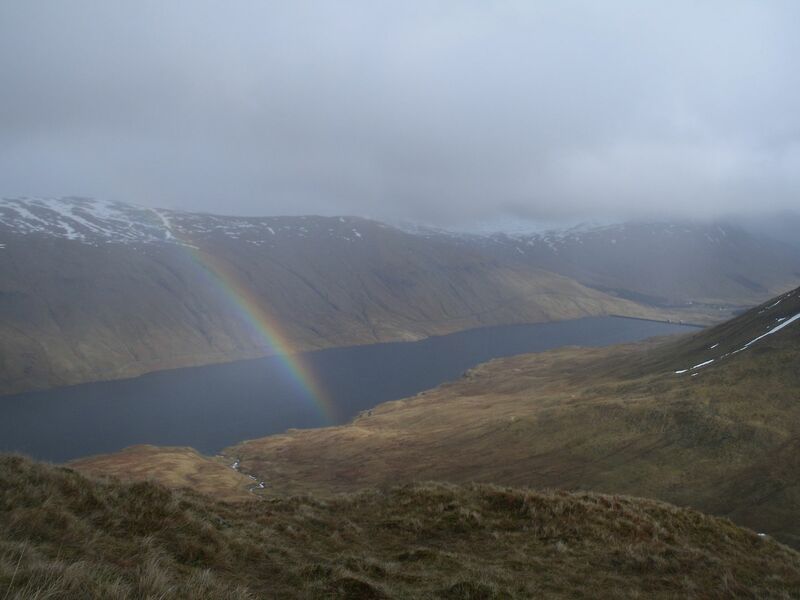 We were getting blasted with varying amounts of rain from our right, but the wind wasn't getting any worse for the increase in altitude, and the sun came out again for a time, and we were getting some nice views of the loch..
With every stich of clothing we had brought on, we headed toward the summit, knowing it was only a km or so away.. surely we could make it that short distance? It turned out to be easy walking, we were round the corrie a bit, so sheltered from the wind now by the summit itself. I noticed the ground was getting rather steeper than expected, then I saw above me, I was heading up to a cornice As I got a bit closer though, I noticed part of it had caved in already, so headed for that and with a monumentous effort, made it over the edge to the summit plateau Dougie was a little behind, so i waited for him and we sought out the cairn together. 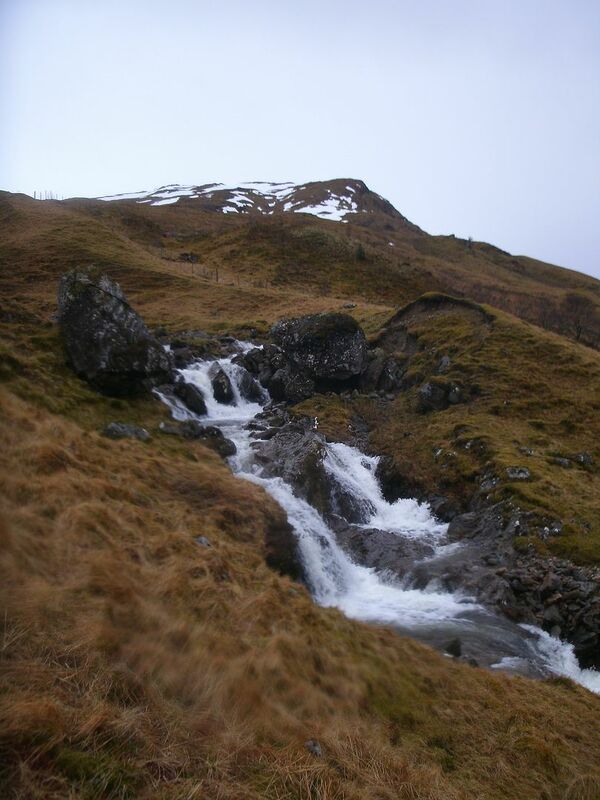 We rocketed down soft beds of snow, almost right to the burn that comes down from the corrie. 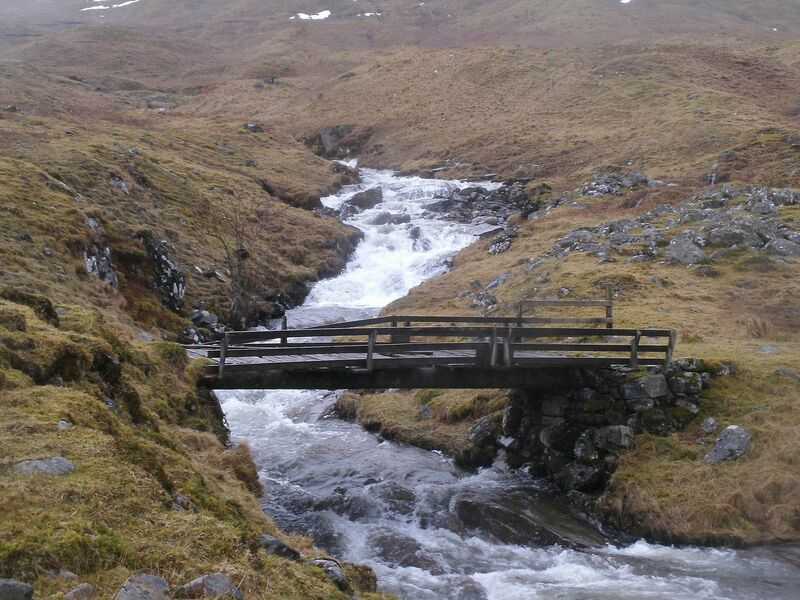 It was a very flooded burn, and rocky as it was, the crossing was still a little adrenaline filled. Dougie looked long and hard before he found a spot he was happy with, and it wasn't far from there, back to the track. The wind had finally dropped significantly suddenly, but the rain got heavier, so it was a damp trot back. 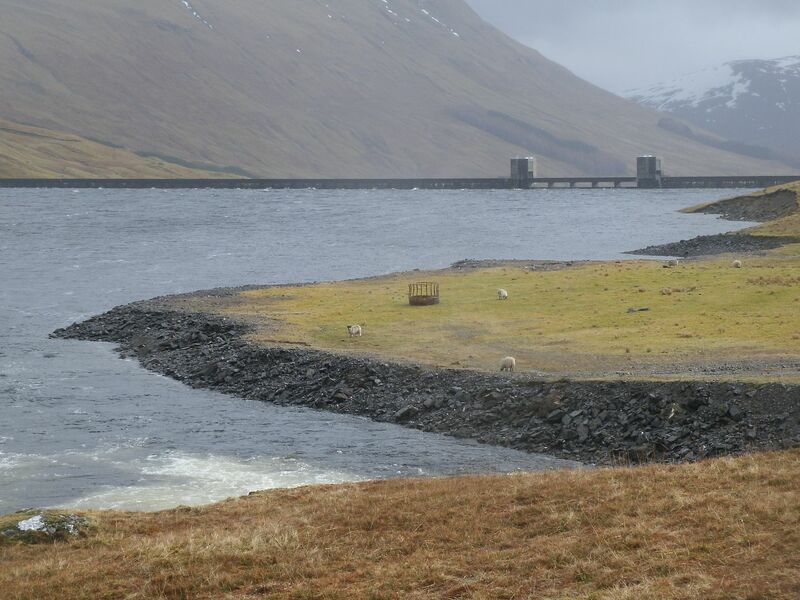 We decided that it would probably be quicker to cross the dam, and get back to the car that way, and it gave us a good chance to check out the huge jet of water that must of been 100' tall at least! Nice one, BC - might do Sheasgarnich from that direction next time. weaselmaster wrote: Nice one, BC - might do Sheasgarnich from that direction next time. 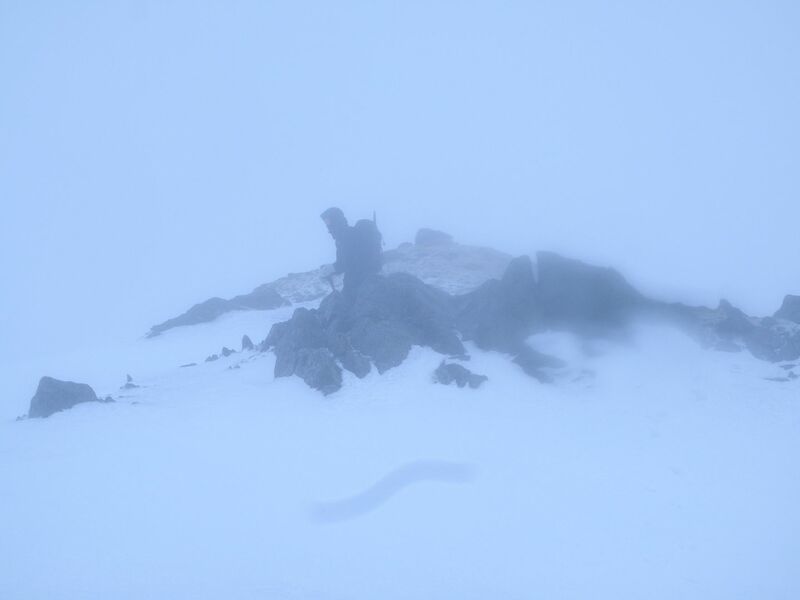 rather more icy, we were soon stopped to put the crampons on. We only needed them for a couple of hundred yards, but I dont think I could of made it down without them. Aye, faster, but in a bloody mess..
You are so intrepid, I love reading your reports! You certainly have grit. The recent strong winds have delayed my plans. 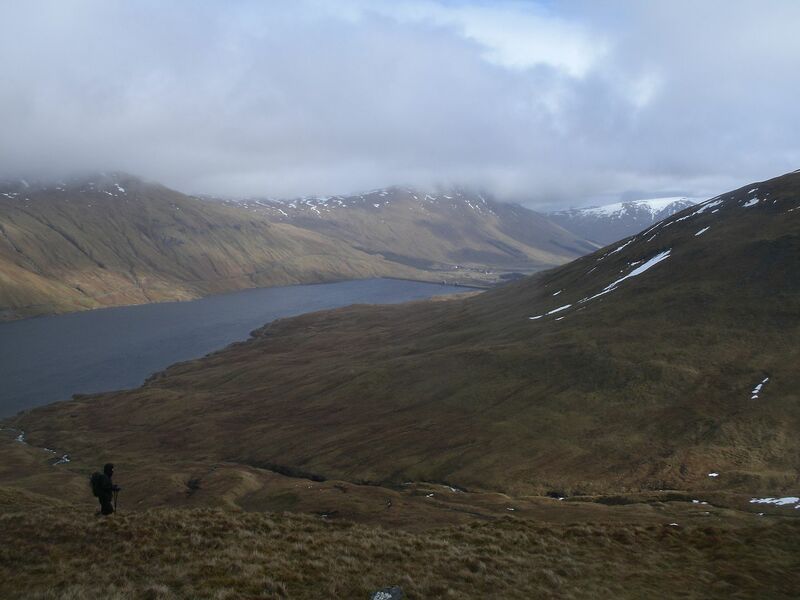 On Friday 14 March I retreated from high on Beinn Udalmain, I was being blown off my feet every few seconds. Needless to say the burns were torrents. 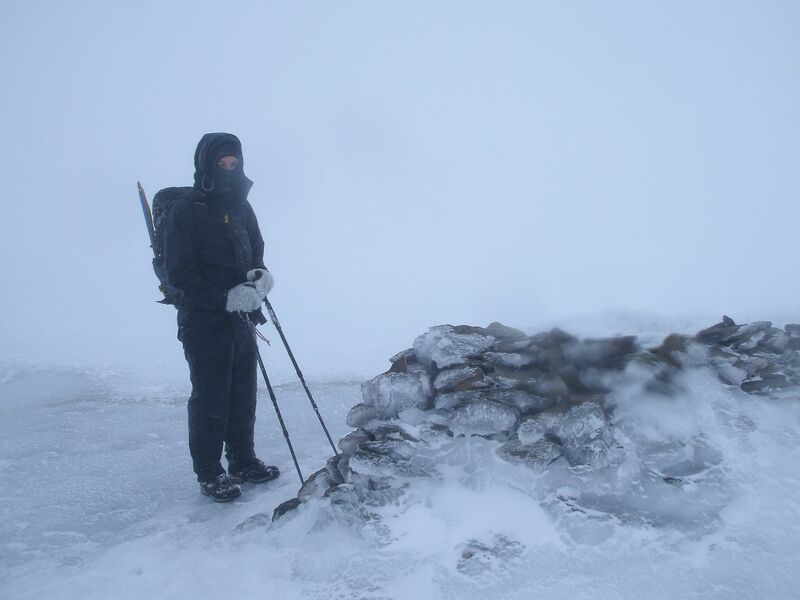 Beinn Dearg, (Atholl) on Tuesday 11 was a rare treat of firm snow and gentle winds by contrast. Wishing you better weather next time. Bert Barnett wrote: You certainly have grit. The recent strong winds have delayed my plans. 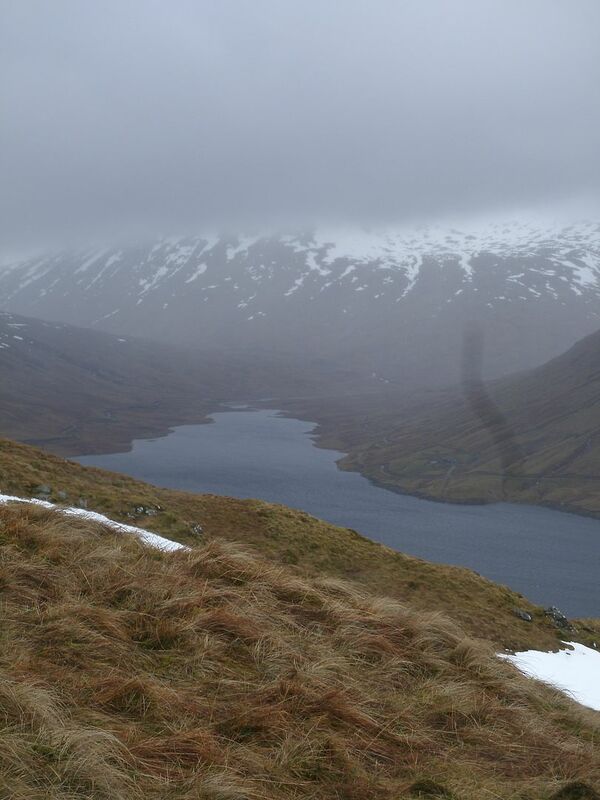 On Friday 14 March I retreated from high on Beinn Udalmain, I was being blown off my feet every few seconds. Needless to say the burns were torrents. 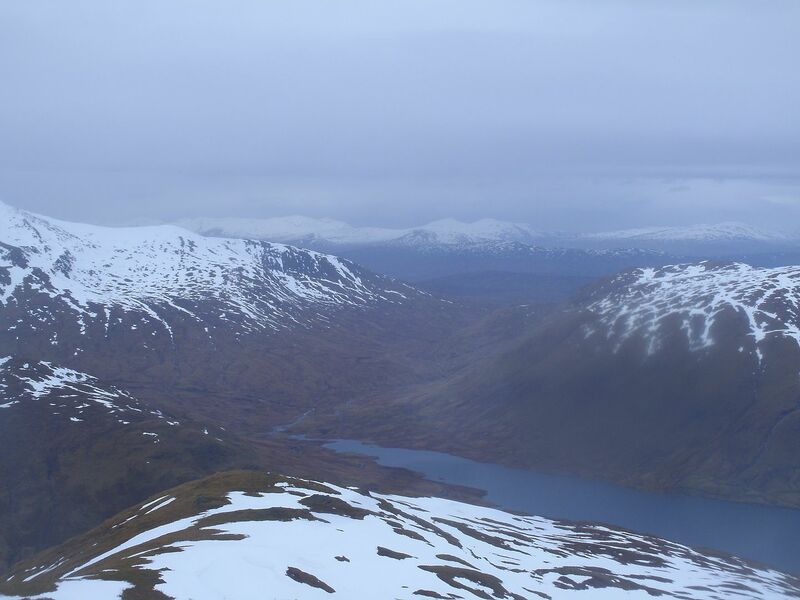 Beinn Dearg, (Atholl) on Tuesday 11 was a rare treat of firm snow and gentle winds by contrast. Wishing you better weather next time. Aye, the wind has definately been a pain in the hoop this winter..